Get your free Mystery Chocolate bar here! If you’re ready to get your free chocolate bar, you’re in the right place. Each month, we hand pick three chocolate bars from top artisan chocolate makers and send them to you in a box… but the catch is they are unlabeled, so you don’t know exactly what flavors or ingredients are included in each bar. You receive your Mystery Chocolate Box, tear it open, and dive into the chocolate bars. While you’re enjoying the chocolate with friends or family (or both, or by yourself! ), you ponder the flavors you’re tasting and guess what you think is in each bar. So, that’s Mystery Chocolate Box. It’s a ton of fun and it’s a better way to discover and enjoy amazing chocolate. Hundreds of people are enjoying their Mystery Chocolate Boxes every month. Now, back to the free chocolate bar. We hear from a good number of people that Mystery Chocolate Box sounds fantastic and they would LOVE to join, but there just isn’t a way to try it out first. And that’s exactly why, for a limited time, we’ll send you a FREE Mystery Chocolate bar. 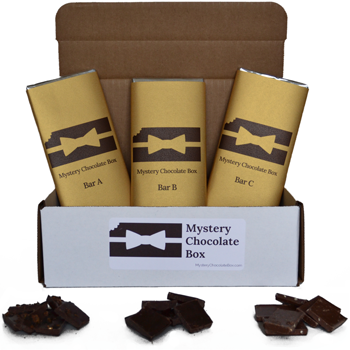 One bar so you can get a taste (no pun intended…) of the Mystery Chocolate experience, for free! Obviously, we’re hoping you love it so much that you decide to become a regular subscriber. But if you don’t, that’s ok too (although we hope you do!). Now you’re probably thinking “This sounds like fun! I’d love to give it a try. Who wouldn’t want a free chocolate bar?? ?”, which is exactly what any logical human being with a pulse would think. So, here’s how you can get your free Mystery Chocolate bar: click the “give me my free chocolate bar” button below and complete your “order”. (One note here: we do ask that you cover some of the shipping/handling cost. It’s quite expensive to ship out chocolate, so our only requirement is that you cover some of it — even with that, we’re actually losing a small amount of money to ship your chocolate bar). Note: Each person is eligible for one free Mystery Chocolate bar only.